These days are days of Muharram and its Persian traditions that some call it “Festival of Muharram”. Muharram and its Persian traditions in Iran, that are part of Shiism, the Iranian version of Islam, can be divided into two era, before 2009 and after 2009. The 2009 massacre, the Ashura massacre, and the story of the Ashura traitors have changed many things in Iran that we would write more about it later. But now, it’s not bad we take a look at the history of Iran and Iranian religions. As you probably know, the religion in Iran has a very long history, more than 10,000 years. Mithraism and Zoroastrianism are two old Persian religions that influenced almost all religions. As we said before, Iran was a big country and only in 19th century and after the Russian and British attacks to Iran (Persia), the country became as small as today’s Iran. The eastern neighbor of Iran was India, and China was the eastern-north neighbor. In the north of Iran, in today’s Russia, the savage tribes lived in the cold and empty areas. The western neighbors of Iran were different countries at different times, from Babylonians and Assyrians to Greeks, Turks, and Egyptians. In the south of Iran, there was the hot and empty desert of Arabia with a few savage tribes. Before the Arab invasion in 1400 years ago, Iranians never thought that the hot and empty desert of Arabia and its savage tribes could make any problem for them. Arabs occupied Iran for about 200 years and after that Iranians tried to free their country and had a series of long and continuous wars with their western neighbors, Arabs and Turks. Mongols and their invasions from the east, solved the problems of Arabs for ever, but they created a new tragedy and a big disaster for Iranians for about 200 years. In the Safavid era, and after 1501, Iranians restored the Persian Empire, but like Europe and other parts of the world, the long and continuous wars, specially with the western neighbors, were part of the daily life. 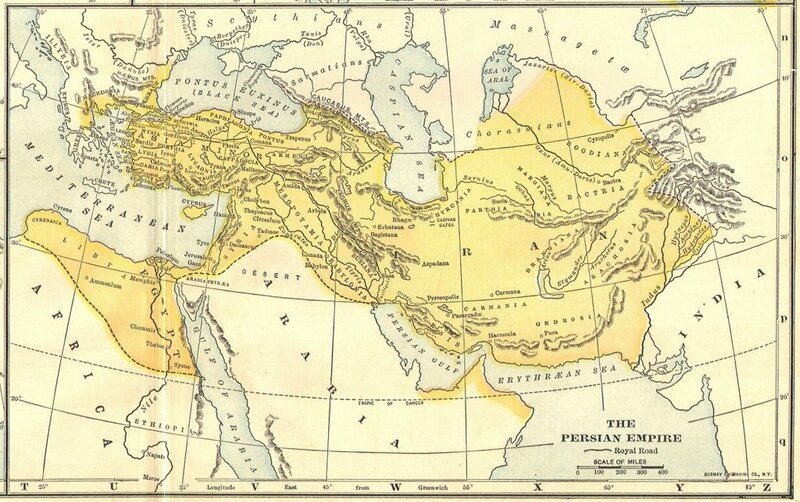 Before the 19th century, only the western borders of Iran changed every now and then, and were not like the Persian Empire in the 5th century BC (below map); but the northern, eastern and southern borders were almost fixed. The story of civilization is like the story of Iran. Hegel writes in his book The Philosophy of history: “The principle of evolution begins with the history of Iran”. The main part of the story of civilization began after the last Ice Age. Broadly speaking, the Stone Age began roughly 2.5 million years ago and ended in parts of the world after the last Ice Age. In the Stone Age, Human groups in different parts of the world began using stone tools at different times and abandoned stone for metal tools at different times. What we know it as “Religion”, is part of the story of civilization, mainly after the Stone Age. As we said before, the history of human evolution, and also the story of civilization and the ancient history have many unclear and ambiguous things. But we can draw a very big and rough picture of what has happened after the Ice Age. During the last Ice Age, in 15,000 to 10,000 years ago, almost all parts of Europe and North America were buried under thick layers of ice. Australia and America were totally isolated and had their own civilization and their own spiritual traditions, but Africa, Asia, and Europe were connected to each others, as “the old world”, and what we know it as “Religion” is a legacy of “the old world”. As you know, the main civilizations of the old world are: Iran, India, China, Egypt, and Greece. Jason Cooper in his book “Mithras: Mysteries and initiation rediscovered” says: “An Iranian, Zoroaster, is the most important person in the recorded history of religion. The first man to promulgate a divinely revealed religion. He influenced the religions of Judaism, Christianity, Islam, Buddhism, Manicheism, etc. Over half the world has accepted a significant portion of his precepts under the guise of one or another of these faiths.” But who were Persians or Iranians? “I am Darius, the great king, the king of kings, Persian, the son of a Persian, ‘Aryan’, from the Aryan race”. It’s what you can read in the Darius’s Inscription in Naqshe-e-Rostam (in Persepolis). It’s one of most valid written evidences of the history of the Aryans. Darius I, the Achaemenian king, in the 5th century BC, declares himself a Persian and an Aryan. Herodotus, that some know him as the father of history, wrote in the 5th century BC, in his book History of Herodotus: “In ancient times, Iranians were renowned as Aryans among themselves and their neighbors”. In fact, as the oldest written records of the human history confirm, the residents of the Iranian Plateau were Aryans. Petri said: “When Egypt had only just begun the art of pottery, the people of Iran were painting beautiful pictures on ceramics.” In fact, when Europe were buried under thick layers of ice, Iranians were creating pictures on earthenware. At the end of the Ice Age, as a result of excessive rainfall on the Alborz and Zagros Mountains and the melting of the ice accumulated on the mountains, the rivers flowing through the Iranian Plateau were so large, and there were several large lakes in the central Persia. After thousands years, with the continuous warming of the earth and the decrease in rainfall, the lakes and rivers gradually became smaller and the peoples living around them, who had a common language and Aryan culture, had to find new solutions for themselves. Some decided to migrate from Iran, mainly to Europe. The historians believe that one of the largest ancient Iranian tribes was Cas Su, Cassi and Kassi, which means fair-eyed and fair-faced. The name of central city of Kashan (Kassan) and also the name of the Caspian sea are a relic of this ancient Aryan tribe. Many relics of the Kassi tribe have also been found in the central Iran, in Qazvin and Khorramabad and other regions. The ancient paintings in central Iran that date back to 15,000 BC show people riding horses. These first Aryan inhabitants of Iran were polytheists, worshiping, as most other primitive people, natural phenomena such as fire, water, wind, the moon and the sun. But they gradually developed a cult that is known as “Mithraism” or “Kish Mehr”. In fact, the major religions of Iran can be divided into three distinct periods. Pre Zoroastrian, Zoroastrian, and the Islamic period. Zoroaster (Zarathushtra) was a Persian who founded Zoroastrianism, one of the world’s oldest living religions, in about 4000 years ago. But many Persian myths and Persian customs are older than Zoroastrianism and belong to Pre Zoroastrian. Mithraism, is the main religion in the pre Zoroastrian era in Iran. Mithra or Mehr was the ancient Persian god of light and wisdom. Mithraism was the root of Zoroastrianism, and Zoroastrianism was the first monolithic religion in the world. Mithraism and Zoroastrianism both influenced a lot of following religions -including Christianity. Many ancient religious traditions in Persia are global traditions now. The idea of life after death, notions of heaven, hell and limbo, the idea of Satan or Ahriman, the idea of crossing of the bridge on the road to heaven (that decide the final fate), the idea of resurrection, the idea of being judged after the death, notion of individual judgment, the idea of fasting and paying religious tax, regarding fire as a sacred entity, using candle and fire in the funeral rites and the ritual, charity and distributing food among the poor, symbolic uses of food, animal sacrifice, avoiding certain foods, thanksgiving to God, daily and periodic ceremonies and ritual, a series of holy days and holy festivals and celebrations, and many other traditions are among what the Persian introduced to the world in 10,000 to 4,000 years ago. Some believe that after Alexander’s era, Mithraism spread rapidly throughout Rome (Italy) and the Roman provinces in the 1st century BC. Mithraism became popular there, and Christianity borrowed many things from Mithraism, that we would write more about it later. Mithraism was older than Zoroastrianism, and many Persian traditions and the Persian myths about Mithra, Anahita, Jamshid, Siavash, Arash, Kaveh, Zahak, Sraosha (Soroush), Rashnu, etc are older than Zoroastrianism and belongs to Pre Zoroastrian, mainly to the Mithraic culture. Anahita or Nahid is the old Persian form of an Iranian goddess, as the divinity of ‘the Waters’ (Aban) and hence associated with fertility, healing and wisdom. [now “Aban” is the name of the 8th month in the Iranian calendar, and “Mehr” is the name of the 7th month]. “The era of Mithraism continued all the way to the time of Sasanian who strongly favored Zoroastrianism hence destroyed many belongings of the Mithraism in the Persian Empire. A similar fate destroyed Mithraism in the west when the birth of Christianity took over Mithraism. Some believe that the Romans feared being taken over by the Persians and tried to become independent. But the Roman Empire regarded Iran as the birth place of Mithraism and they made no attempt to hide it. Christianity had many similarities with Mithraism, from Virgin birth and Christmases to Killing and Resurrection. Iranians had, and still have, a special feast on December 25, on the night that Iranians call it “Yalda Night” (Birthday Night), that was the birthday of Mithra. On 25 December, the Persians had a general festival of the light and the sun. Have you ever wondered why December 25th was chosen to celebrate the birth of Christ? we would write more about it later. Anyway, in Iran, before the Arab invasion, there was a rigid class system in which the noble remained so through heredity, and the lower classes were forever denied the chance of social rise no matter how able or clever. And then came the Muslims, with a monotheistic faith, which promised equal opportunities to all. Of course, the fanatic Arabs were so stupid and savage. They resorted to ethnic prejudices and a social hierarchy in which the Arab was the master by birth. So, Iranians did not accept the Arab version of Islam, and they created their own version of Islam. Shiism first developed and spread among Iranians and gradually extended all over the world, but most Muslims have always been Sunnis or “the people of the (Prophet’s) tradition”. Sufism or Sufi Mysticism is another important cult or sect that was made by Iranians within Islam. Iranians already had their own Mysticism in Zoroastrianism and Mithraism. Unfortunately, many know nothing about the Iranian version of Islam, Shiism and Sufism. The majority of the religious people in Iran are fans or followers of Iranian Mysticism or Sufism, and they hate the Mullahs and the Mullah Islam. Shiism and Sufism have fought against the racist and fanatic Arabs. When the Arabs celebrated their new year in Muharram, Iranians had the festival of mourning in Muharram, and in this way they fought against the fanatic Arabs. The Iranian mystics have always fought against the orthodox and the fanatics. An Iranian mystic in 11th century said to his followers: You should feed every one that knocks your doors, and you never ever ask them about their religion or race . The great Persian poets, like Hafiz, Rumi, Attar, Khayyam, Abu-Saeed, Baba Taher, etc were Sufi. Even non-Sufi Iranian poets were so open-minded. Sadi, one of the great Iranian poets who lived in the 13th century, said: “Human beings are members of a whole – In creation of one essence and soul; If one member is afflicted with pain – Other members uneasy will remain; If you have no sympathy for human pain – The name of human you cannot retain”. In fact, Iranians were not like Arabs, and they tried to mix Islam, Zoroastrianism, Mithraism, and other Persian traditions and created a new sect for themselves. In the Safavid era (1501- 1722), the Safavids who were Sufi, used this new sect to restore the Persian Empire. Many of current Islamic traditions in Iran, including the Nazri and Sofreh tradition, and the festival of Muharram and Ashura, are parts of the new or old Persian traditions that the Safavids restored or created them. In Iran, Siavash was a national hero and the first innocent martyr since the Mithraic era. The legend of Siavash says that he was a legendary Persian prince, son of Kay Kavus, Shah of Iran, and due to the treason of his stepmother, Sudabeh (with whom he refused to have s-e-x; like the story of Joseph and Zuleikha), exiled himself to Turan where he was killed innocently by order of the Turanian King (Afrasiab). Siavash was later avenged by his son Kai Khosrow. Siavash is a symbol of innocence in the Persian mythology. Since at least 5000 years ago, Iranians have had a ceremony or festival, “Suge Saivash” or “Saivashan”, that was a festival of Mourning for Saivash. It’s quite clear that what Iranians and Shiite Muslims do in Muharram is not Arabic tradition. It’s totally a Persian tradition. In Iran, one of the ancient traditions is that the people cook food and give it to others, including the poor, friends and family. This charity food or free food, is called “Nazri”. In fact, Iranians donate food and this act is call “Nazr”. It occurs when you ask something of God, and promise to make and distribute some kind of food to other people, in return. Nazr and Sofreh is a religious Persian tradition. During the festival of Mehregan and Nowruz, meat and bread were distributed, and the Zoroastrian have the tradition of Sofreh and Sofreh Nazr. In fact, traditions like Nazr, Sofreh, Festival of Muharram, Islamic Mysticism, etc are Persian traditions, not Arab traditions. Some funny Iranians say: “Arab Malakh-Khur ro che be in Harfa” (The Arabs who ate Grasshopper could not even think about these matters). According to the Persian myths, the Siavash’s blood became the first “Tulip”, and after that the tulip became the symbol of martyrs. Siavash and his legends have created many things, including the first religious theater and plays (Tazieh), the first mourning festivals (Siavashan), the first mourning songs, etc. Some say: “Iranians didn’t expect any respect from Arabs, but it’s funny while the Persian traditions and the Persian religions have had a great and significant influence on the western culture and the western religion (Christianity), the western media and the western politicians talk nonsense about Persia and Persians”. It’s really shameful. You are currently browsing the News About Iran blog archives for the day Sunday, December 4th, 2011.